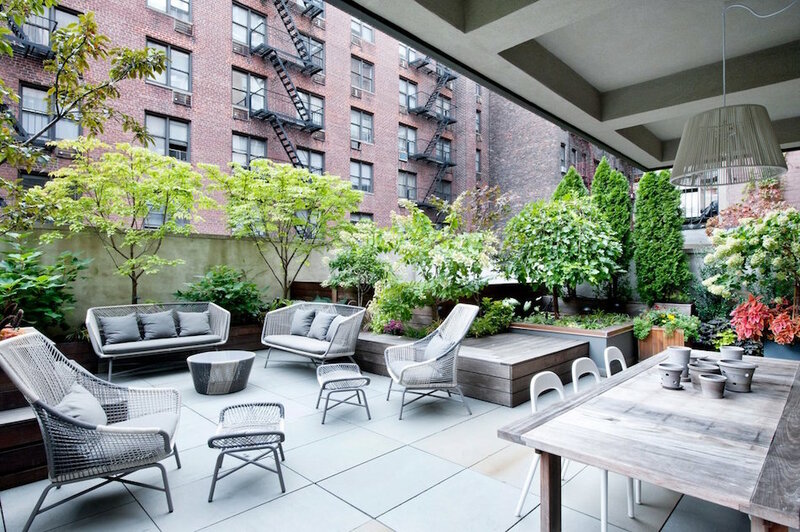 DHD Architecture & Interior Design created an urban oasis in Manhattan’s Gramercy Park neighborhood with this sprawling 800-square-foot terrace, which is lined with shrubs and flowering trees. The patio is located off the living room, “which makes the loft feel endless and extends our living space eight months a year,” says designer David Howell, who lives in the apartment with his wife and partner, Steffani Aarons, and their children. “The landscape was designed to place the glass box of the penthouse in a romantic, tree-filled garden,” according to Rees Roberts & Partners’ David Kelly, who created the landscape atop this 1840s townhouse in New York’s West Village. The space, which includes a fireplace and bar, opens onto a grassy outdoor terrace with custom bench and potted hedges. “The plantings provide shade and privacy for the occupants while also creating two distinct zones for lounging and dining.” Steven Harris Architects designed the penthouse. Emily Summers Studio updated this 1969 home in Indian Wells, California, located on the golf course of Eldorado Country Club. The clean lines of the mid-century structure and the all-white palette keep the focus on the rich green of the grounds and the tropical plants that provide privacy from golfers. 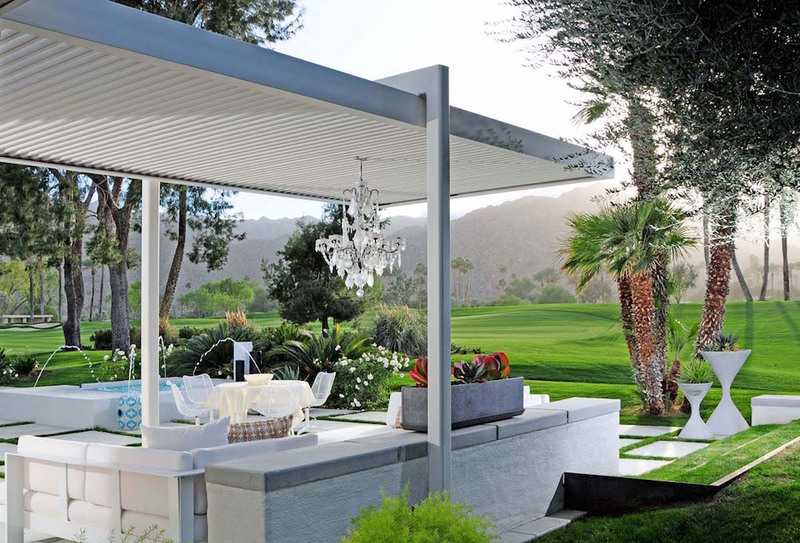 The poolside patio and outdoor lounge areas were created to work with the existing golf course landscape and to take advantage of the views of the desert mountains. 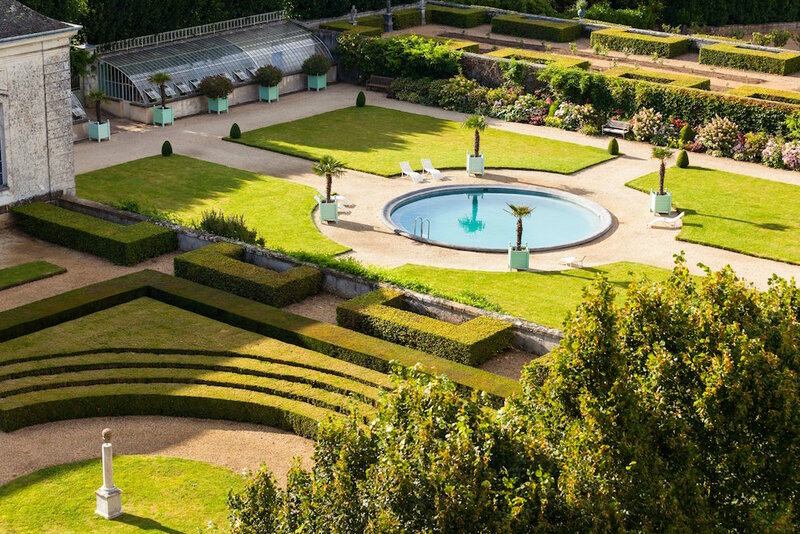 At Château du Grand-Lucé, the estate that Timothy Corrigan restored in France’s Loire Valley, the Exotic Garden was in the 18th century a preserve for horticulture specimens, like palm trees, that were not typically found in France at that time. In the center of the garden is a pool, which is a former fountain that Corrigan made wider and deeper for swimming. BoydDesign updated Craig Ellwood’s 1956 Steinman House in Malibu, with a sleek pool and a brick-paved patio punctuated by palm tress. Bird of paradise and other tropical plants grow along the wall on the opposite end of the pool (foreground).